If you're just joining in on the fun, you can find the start of the train here: A Faith Perspective First, we would like to take a moment to thank our generous co-sponsors: Layers of Colors Stamps, Gina K Designs Stamps and Sweet ‘n Sassy Stamps. Together with Scrapbook News and Review Magazine, these companies have donated some wonderful prizes for today’s blog hop. Prizes? Oh, yeah! There will be three lucky grand prize winners for today’s event. games@scrapbooknewsandreview.com listing each of the staff members who participated in today’s hop. It’s that easy. All entries must be received by Monday, November 16, 2009 at 12 noon, EST and three winners will be randomly chosen to win. One $100 gift certificate from Layers of Colors Stamps AND a 6 month subscription to Scrapbook News and Review Magazine. One set of digital stamps from Sweet ‘n ‘Sassy Stamps and a 3 month subscription to Scrapbook News and Review Magazine. In addition, every participating staff member of Scrapbook News and Review Magazine will offer a free one-month subscription to the magazine to one of their lucky visitors by simply for leaving a comment on their blog. That's a lot of chances to win, so let’s get to the Hop! Here is my project for this themed hop. 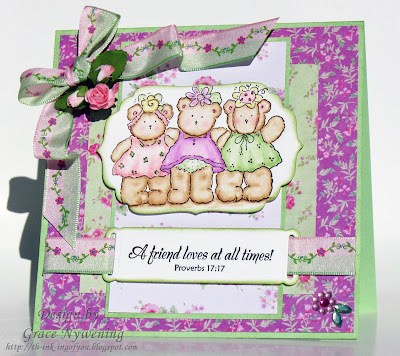 I used images and sentiments from Our Daily Bread designs “Friendship” set and made a double pocket card. I used retired SU! Certainly Celery designer paper for the pocket base. I used glossy card stock for my white and Martha Stewart designer paper for the backgrounds of my bookmark pullouts and the belly band. I used Stazon Olive Ink, a Martha Stewart edge punch for my belly band, an EK Success flourish punch for the flourishes, a Spellbinders Label #6 for my dragonfly image panel and mat, a Cuttlebug Swiss Dot folder, Cuttlebug Butterfly Die cut/embossing combo, a CB edge and some green vellum for the butterflies and leaves. I rubbed my Olive Ink on the CB folder to add definition before embossing. I finished with some pearls and Prima Hydrangeas, and topped the bookmarks with SU! ribbons. I chose these stamps because I believe that the type of “bond” that is referred to in our inspiration Scripture today is truly a gift from God. We were not designed to be loners. Our Maker made us as social beings, and we are fulfilled through relationships with others, and likewise, we are to help others be all that the Lord created them to be. Whether it's getting a job done, lifting one up when they are down, or just enjoying the company of a like minded person, true Godly friendship is truly a blessing! I love how all the Our Daily Bread designs sets are God honoring sentiments and Scriptures. They have opened a door for those of us who want to share God's Word through our cards. I wanted to just briefly show you another card I made for this hop, which will be seen on Women to Women, along with a few thoughts on today’s Scripture. All of the regular writing contributors to Women to Women will have a project to share with you. I hope you’ll continue on the hop and take the time to read the posts. I titled this card “A Chord of Three” based on the 12th verse of Ecc. 4. “A chord of three strands is not quickly torn apart”. That verse made me think of these three little friends linked arm in arm. While all the details are listed on WTW… this image is Penny Black and the sentiment is Our Daily Bread Designs Friendship. DP is Daisy d. The ribbon was in the blog candy I won from Crystal (Sugar Crystals). Thanks so much Crystal! I hope you have enjoyed my projects for this blog hop! Thanks for stopping and now…. Have fun on the hop! God bless! Oh, Grace!!! My heart has been melted!! Both of these are gorgeous beyond belief! Your work is so amazing, as is your great big wonderful heart!!! Speaking of friendship, I'm so blessed to call you friend!!! God Bless!! what a fabulous creation Grace, gorgeous work....have a blessed weekend! Your pocket card is a stunner, Grace! Gorgeous! And adorable sweetness in your bear card! Lovely details on both! What a delight to hop along this special blog hop with you! These are both absolutely stunning Grace!!! 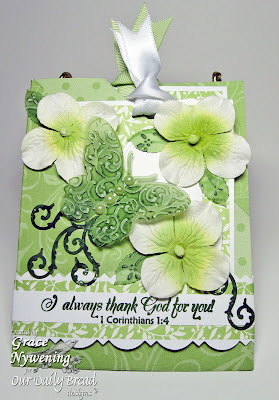 Love the green with all the flowers on your pocket card and your coloring and image is so sweet!! Congrats on being one of the top 7 for Mojo Monday my friend!!! Thanks for all your inspiration and for being such a blessing!! Grace your work is so 'God honouring' - I love it, and all that you share. Grace, your cards are always such a delight! Hi Grace!! Wow your projects are stunning! That green butterfly is just awesome! I'll have to come back and take a closer look at that! God Bless You!! I'm back....for more drooling over the green pocket card....that is one fabulous piece of paper-art!!!! I'm always so blessed to visit here at your blog. You just let God's love shine through you even through your creativity. I'm signing up to be a follower if I[m not one already. Grace, that green double pocket card is a jaw dropper. Wow. They're both so very nice, but I really like that one. Grace you make amazingly beautiful cards!! I love all the projects you shared today!! MAy God bless you!! Oooooh! 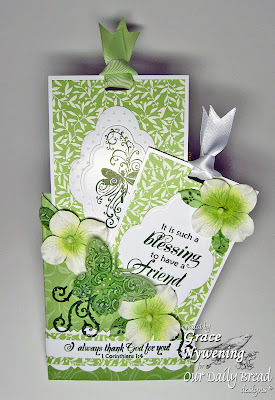 I just absolutely love the green and white card! Such beautiful color, rich texture and gorgeous embellishments! The second card is so sweet - definitely gives the warm fuzzies. I truely love your bookmarks and the card is so pretty too! Thank you for the beautiful music on your blog as we all hop along! Grace, your cards are awesome works of art. God has blessed you with quite a gift! The first one is my fave, but I love both Scripture verses you've used for this focus. And we were on the same page with the "cord of three" concept! God's blessings! Just gorgeous!!!! Have a blessed day my dear!! Such a lovely card set! Thanks for playing along, this weekend!! Beautiful cards. You do such amazing work. Thanks for sharing!! Beautiful and uplifting as always! I love the way you based the three friends on that verse from Ecc. I love that verse and have alway thought of it in relation to any relationship I have, and especially my marriage, with God being that third cord that binds our hearts together. I love how you showed the friendship aspect of it. Gorgeous cards! Enjoyed your blog. I'm blown away at your cards. What a creative person you are. Thank you so much for your encouragement. these are both just fabulous -- i esp. love all the green on that pocket card! you have such a way with details and layers and accents! Your cards are just beautiful. Love your comment about how we were not made to be alone, we were made to be social creatures. This weeke end has been somuch fun. TY for your lovely comment on my blog. Grace, your cards are just stunning! I love that green one. It is just beautiful! Your work is absolutely incredible and truly artistic! I am very happy to have come across your blog today! Thank you very much! Thanks for leaving the sweet comment on my blog. I just noticed that you are in NC. I live in Hendersonville. WOW! Your work is gorgeous! I am blessed that we could share the Love of Christ through this blog hop! Blessings to you! Oh, AAAAAANNNNNNDDDDDD I love those shades of green SO MUCH!!! This project rocks my socks right off!! Grace, these cards are both totally amazing! I always love your style, and you have just outdone yourself. I love all the layers and all the beautiful details. Your cards are inspiring and you are an inspiration as a woman of faith! TFS and have a blessed day! Beautiful cards. Thank you so much for sharing. I have really enjoyed visiting your blog. LOVE the double pocket card! They look like they can be used as bookmarks and I love that idea. Beautiful. Have been enjoying your writing on WTW too! Blessings and Peace to you! These are absolutely beautiful.The colors you chose are so eye-catching.Thanks for sharing your talent! Oh WOW Grace, the colors and design of the green pocket card are absolutely beautiful. Thanks for stopping by my blog and for sharing your God given talent. Wow! Love the color and texture of the green card! It is sooooooo pretty! The second card is great too! Love the ribbon! Love your creativity, you always have the prettiest designs! Loved your cards, so elegant!! Thanks for letting me stop by to enjoy! Your work took my breath away. simply stunning work. Those green cards are so beautiful. Wow. Wow Grace, these are so stunning. And I too love ODBD stamps. They are amazing. Thank you for sharing these beautful cards. God bless you. Gorgeous, gorgeous projects Grace! I always love visiting your blog. P.S. My cats are around 16 lbs, too. They're huge! I love them so much, especially Jazzy, my shadow... who just jumped in front of the computer screen. I think she's telling me it's time for bed! Hi, your creations are beautiful, I can see the love of the Lord and the time you put into each one. This hop has been so fun for me and I am glad that I have visited you. Dear Grace, I'm thankful for this blog hop; for if it hadn't been, I might never have found your blog and your absolutely stunning creations. You are so blessed with talent. Thank you for sharing your love of HIM. Hugs and blessings from me to you. And what a wonderful blog hop that we can share our love for HIM through our art. It's always a blessing, Grace, to visit you here and witness your love for the Lord. How well you exalt His name. Your creation is just spectacular...as always, but it is the love of Christ that pours from your heart through your words of wisdom and passion that bless beyond measure. Love your work...and love your heart more. So glad you are my friend!!! Love you, sister! So thankful for the blog hop that let me find your beautiful blog. Your cards are simply stunning! I particularly love the butterfly! You are so very talented and your testimony of God shines through your work! Wow - your cards are so amazing! I really love the first one since I just love the colour! But the second one is also amazing! I have been so blessed - thanks so much for participating in this op!! I enjoy your work so much. It simply lifts my heart. Thank you for your kind words on my blog.Our church had our holiday bazaar on Friday and Saturday. I usually make cards and not many are sold. This time I only made a few cards to sell but focused on taking orders with delivery next Sunday(orders for 40-I will be busy). The cards with the most orders..are those with scriptures verses. I think the Lord was watching over me and was pleased with my choices. All of the money is going towards mission work... and the food bank in town. Your cards are absolutely beautiful!! FABULOUS ODBD CARD - Grace!!! I love this kind of pocket cards too...still haven't tried one :(. The color is very striking and the design is just perfect!!! The bear card is super adorable - love all that purple :)!!! Oh, my goodness, I can't imagine creating cards that look like this- cards seem to be a real challenge for me, yours come out so perfectly professional looking! Oh grace, these are just extraordinary cards. Blessings to you friend.